If there’s one thing that can be said for this week, it’s that it’s been a productive one. Teddy has been walked many a mile (on Tuesday in weather so rainy that I actually had to go out and buy new trousers, since I was spending the day working in Jason’s studio and didn’t fancy having my jeans plastered to my legs all day), the house has been freshened up, and I’ve got my head firmly back into the swing of things after a slowed-down couple of weeks. It’s been a good one! Rainy, but good. I hope you’ve had a great one too! This weekend we’re looking forward to a trip to Covent Garden, and cooking and eating plenty of delicious things. Maybe another blackberry and apple crumble. There’s always room for crumble. Here’s to happy things! 1. Having a massive three hour intensive tidy-up of our spare bedroom yesterday, whilst turning it into an organised and useful home office space. What was supposed to be a half hour sort-out of the desk drawers turned into a mega blitz, which resulted in two bags of rubbish thrown in the bin, one bag of clothes for charity and another for my sister, and me having a lovely peaceful office space to work in. A winner all round! 2. Wearing LAYERS! Oh boy, have I missed layering! 3. The kind fiancé who went through the massive hassle this week of switching over to a different computer so that I could have his laptop, after mine exploded (literally!). It’s been a giant palaver for him, and I’m very grateful. 5. Essie’s Bahama Mama polish on my fingernails. Forever my favourite autumn nail colour. 6. Sampling Uzuma green juices! I was sent a box earlier this week, and they’re really really great. All cold-pressed (which retains vitamins) high-pressure processed (also ++vitamins), and really tasty. I’m impressed, definitely would recommend. 8. Finding a huge folder full of family photos (from my Grandma’s 80th birthday) that I thought I’d lost forever when my hard drive crashed last year. I’d totally forgotten that I’d had them printed, and am so very grateful I did. 9. Gabrielle Aplin’s album. It’s the most perfect music to listen to whilst writing, I can’t stop listening to it. 10. Waking up to a bedroom full of cool autumn morning air, and feeling so snug under the duvet. You can’t beat that contrast between cool + warm, if you ask me! Take five with :: Spoon. 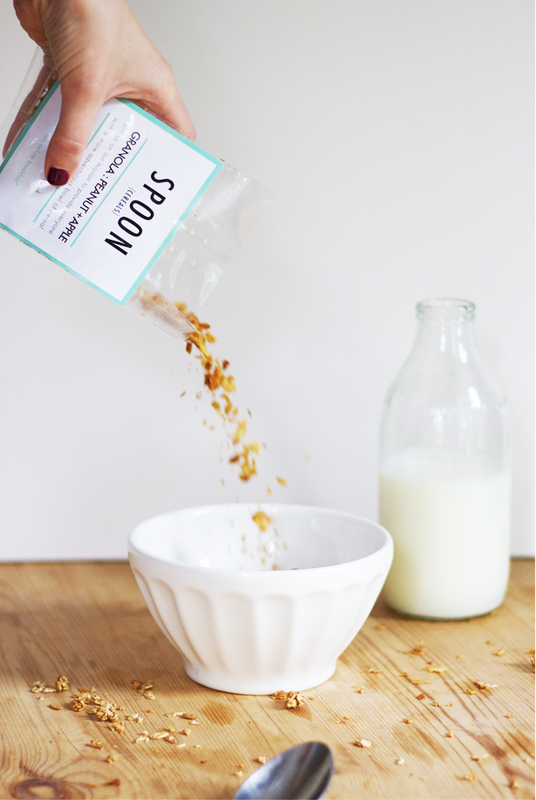 If you’re not already acquainted with Spoon cereals, then please consider this post to be your friendly wake up call to the new kids on the breakfast cereal block! I first became aware of Jonny + Annie (Spoon’s founders) when they popped up on my TV screen during an episode of Dragon’s Den a few weeks back. We got talking online not long afterwards, and over the past week I’ve been sampling their range of granolas and mueslis both during bleary-eyed mornings, and as a way of satisfying evening cravings for something sweet. 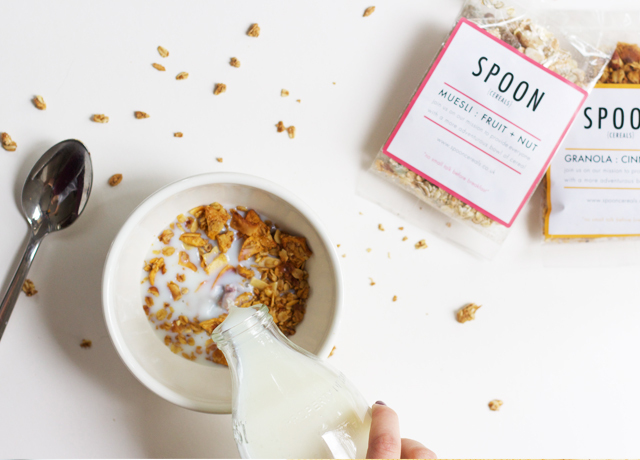 Jonny & Annie launched Spoon with the intention of reinvigorating breakfast time, and if you asked me, they’ve managed it. 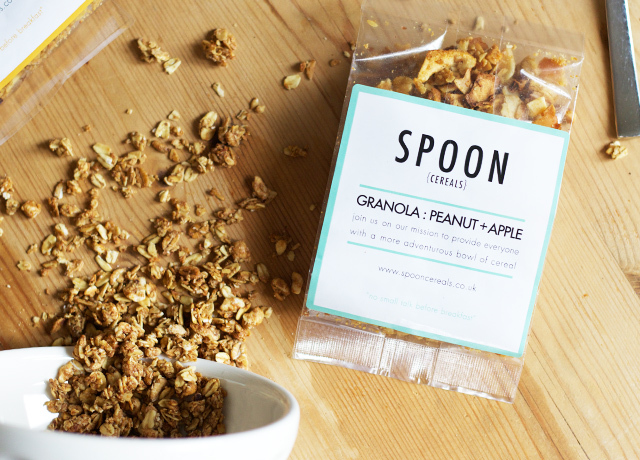 The range currently comprises of two granolas (peanut + apple, and cinnamon flavours), fruit + nut muesli, and an ingenious muesli/granola mix. 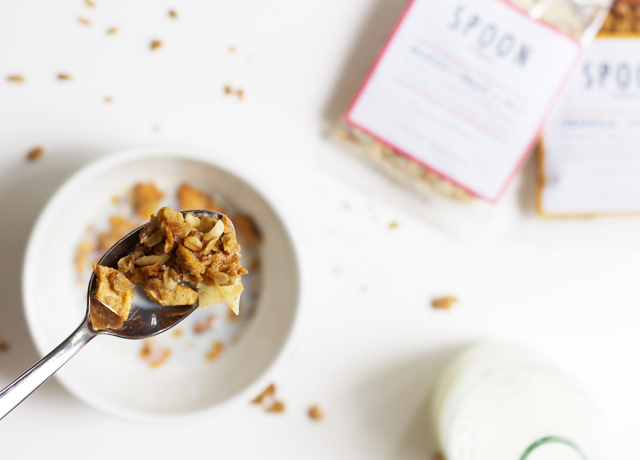 The peanut + apple granola is my favourite, I think, with its flakes of buttery coconut and soft apple chunks and crisp flakes. Divine. 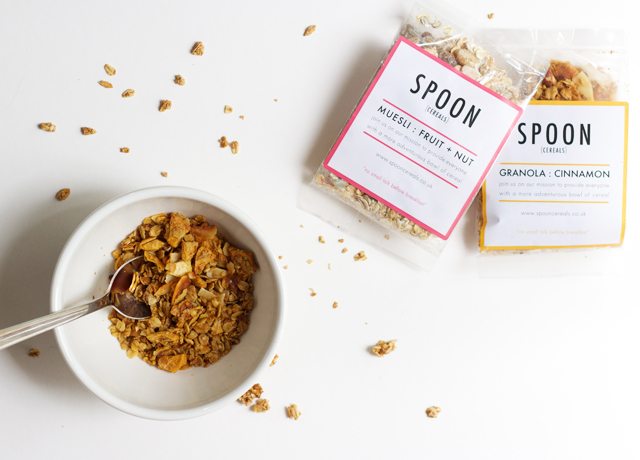 And whilst we’re here, can we just take a brief moment too to admire Spoon’s branding? I think it’s killer. Nothing gets me like a bold sans-serif font. 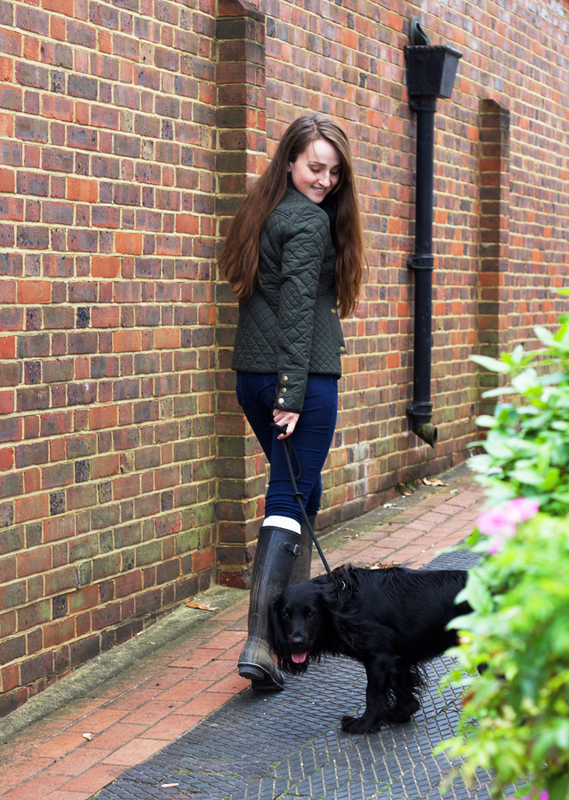 W O R N :: A jacket just made for blustery Autumn dog walks. That time of year has come around again, where the hunt for the perfect coat for long countryside dog walks in changeable weather must begin. The coat needs to be lightweight, rain-proof, layerable, and if at all possible, stylish enough that you won’t feel the need to sigh and grumble when you put it on each morning. Enter, the Boden City jacket! I had a little credit on my Boden account left over from summer, and decided to invest it wisely in a jacket that’ll hopefully take me right through this autumn and maybe (with a little clever layering) winter too. It’s so beautifully fitted, shower-proof, warm, and fellow muddy-dog owners will be happy to learn, totally wipe-cleanable too! I especially love the detailing on the jacket- the elbow patches, corduroy-trimmed cuffs, and POCKETS! So many pockets, all crying out to be filled with iPhones and keys and dog treats and whistles and pairs of gloves that have holes in from a certain dog’s puppy teeth. It comes in navy, khaki, and a deep red colour, but that unfailingly versatile (not to mention beautiful!) khaki colour had me at hello. Jacket :: Boden City Padded Jacket. Jeans :: GAP Always Skinny jeans. Wellies :: Hunter Original Tall boots. Hanna’s blog is one that was introduced to me a good many months ago now, and I’ve been a loyal reader ever since. I love the way Hannah writes her posts- they’re always so serene and unassuming, and make you feel as though you’ve escaped into her personal journal. She shares recipes for sweet treats, dreamy photos, and snapshots of her beautiful little family. 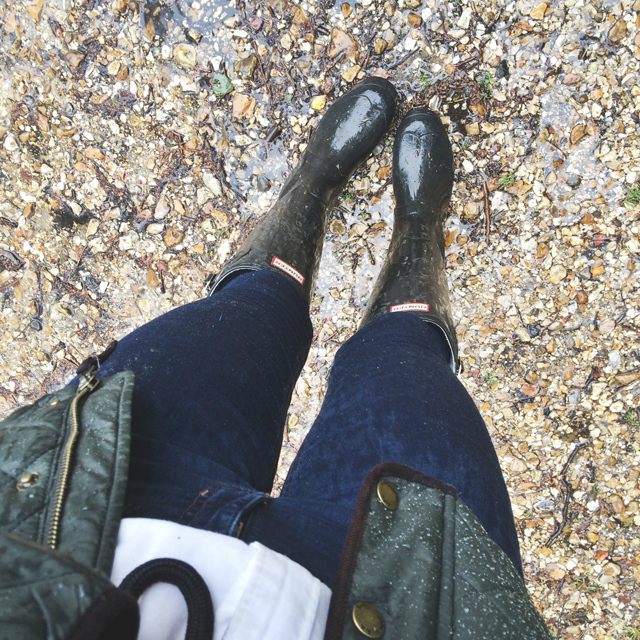 It’s the sort of blog you could lose yourself in, and I wholeheartedly recommend you do! Oh, I just adore Lisette Loves! I stumbled upon her blog (and then across her YouTube channel too!) about a year ago, and I’ll tell you, it’s impossible not to be drawn in by Lisette’s personality! It comes shining right through everything she does! Lisette Loves is full of (you guessed it!) the things Lisette loves the most, and features wonderfully engaging lifestyle posts, outfit photos, recipes, and my favourite of favourite ‘Thankful Thursday’ posts which are dedicated to thoughtfulness and gratitude. Truly a wonderful read. Have you fallen in love with Anya’s blog yet? She’s just such a talented, wonderful lady! Not only can she take a killer photo and illustrate the most beautiful pieces, but now she’s even risen to the (amazingly difficult!) challenge of eliminating sugar from her diet! Anya’s posts are always so beautifully put together- from the gorgeous photos in her recipe posts, to her candid ‘quitting sugar’ updates. I just can’t recommend you follow along with The Peppermint Pencil highly enough! I had the pleasure of meeting Ala in person this month, and it’s only gone and made me enjoy reading This Particular even more than I did already! There’s just something about Ala’s blog- I think it’s that her writing truly reflects her lovely ‘real-life’ personality! Ala’s posts range from recipes (right now she’s doing a GBBO cookalong, girl after my own heart!) to happy catch up posts, London restaurant reviews, and the results of her experiments with film photography. 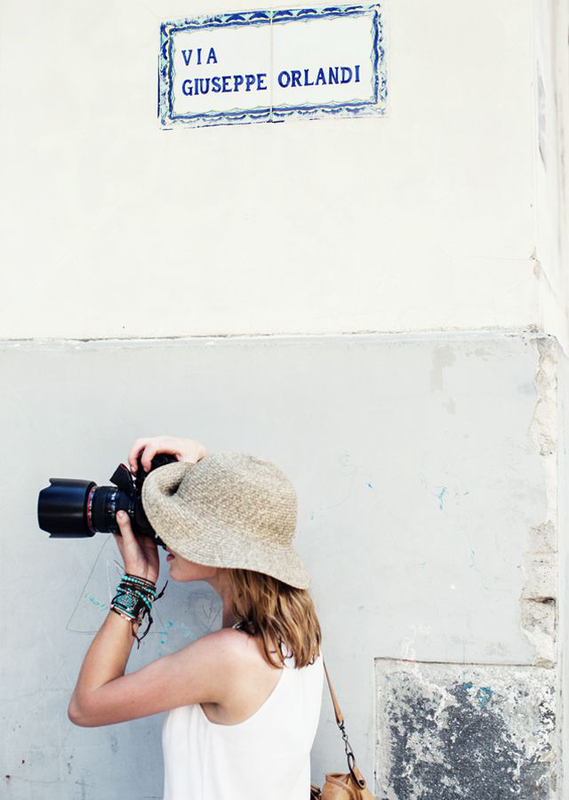 If you’re a fan of a charming lifestyle blogs, then This Particular is one for you! Angela is another blogger I was lucky enough to meet in person in August, after so many months of talking online! Her blog became a firm favourite of mine from the very first time I read it, and Angela is just as delightful in person as she is on her blog! The Awkward Blog is my very favourite kind of lifestyle blog- full of gorgeous photos from Angela’s adventures (she just got engaged AND got kittens, adventures for days!) fun recipes, restaurant reviews, and snippets from her life in London! I just adore it- and am no less than 100% certain that you’ll love it too! It’s been such a pleasure to catch up with Sara’s blog, after she advertised here a good few months back! Thursday Afternoons is the most dreamy blog, with just about the prettiest and most feminine blog design you ever did see! In the past month Sara’s been sharing the most gorgeous posts all about her time spent exploring Croatia, and her photos are just divine! She’ll make you want to jet straight on over there, I promise you! It’s been so wonderful to catch up with Thursday Afternoons again- it’s a blog I know you’re going to just love! I’ve just loved getting to know Bridget online in August! She’s such an inspiring blogger, baker, and woman in general! She began writing her blog as a way of exploring and sharing her wholesome recipes (all gluten and dairy-free) as a way of nourishing her body after bout after bout of ill health. It’s incredible to read her story of how cooking and eating wholesome food has changed her life! Bridget’s recipes are always accessible, healthy, and delicious-looking, and I for one am excited to give her gluten-free soda bread recipe a go! Oh, it’s never a dull day when I get to sit down and catch up with Caroline and her wonderful blog! She always has the most fun, interesting, engaging posts on her site- from reviews of food and drink hotspots, to the very best places to travel! Caroline’s travel posts are my especial favourite- she always sells me on wherever in the world she’s visited most recently, so the point where I suggest it to Jason as a possible honeymoon spot! You must go and check out her photos from Camogli in Italy- they’re just stunning! I met Emily well over a year ago now (at a party in London where I didn’t know a soul, and was so glad to see a familiar face! ), and have followered her blog for such a long time! It’s always such a lovely read- full of style posts, product + restaurant reviews, how-tos, and even more besides! It’s the sort of blog you’ll stop in on to just read a post or two, and find yourself reading months into the back catalogue half an hour later. And if that’s not the mark of a good blog, I don’t know what is! It’s always such a pleasure to have Jenny’s blog linked in my sidebar, especially since Sunny Sweet Pea has recently undergone a major facelift making it (if possible!) even prettier than it was before! Jenny’s blog is always such a lovely one to escape in to- her world seems to be such a beautiful one! 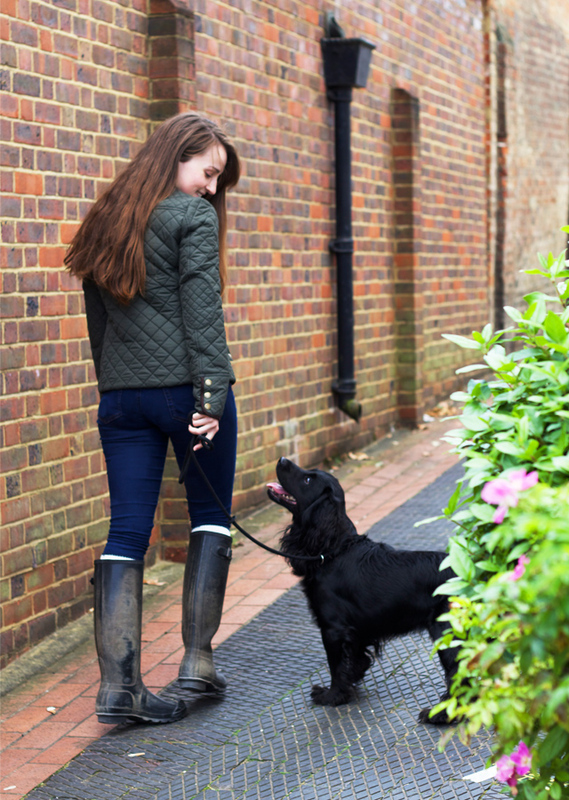 It’s never a bad day when you click through to a blog and are met with a pup as beautiful as sweet Pip, and Jenny’s recipes, home interior posts, and lifestyle posts are not to be missed. Just such a happy read! I stumbled across Owl Girl one day after clicking through from a comment Candy had left on my blog, and am so glad I did! Owl Girl is such a bright, happy online ‘world’, full of crafting and photos of the beautiful things Candy’s wears, how-to posts, and stories from Candy’s family and recent goings-on. I just love it! Owl Girl is unique and individual in its styling, and I’ve just been loving getting to know both it and Candy over the past few weeks. Brew of Blessings || Favourite post? :: Lessons from year two. p.s. Click through to the Sponsor page and take up an advert today, to see your own blog featured here this time next month! :) Tweet me if you need any more information! ** Image :: via the wonderful What Katie Ate.